Do512 and Alamo Drafthhouse are proud to present Austin Sound & Cinema, six summer nights of great live bands paired with classic Hollywood movies. 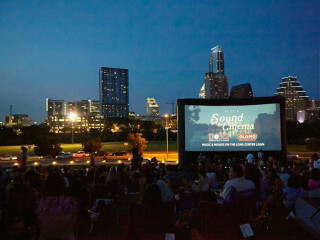 This six-show series will take place on alternating Wednesdays all summer long on the beautiful lawn of the Long Center, with the perfect view of the downtown Austin skyline behind the stage and giant inflatable Drafthouse screen. In addition to the entertainment, visitors can enjoy treats from food truck favorites such as Frank, The Peached Tortilla, Yeti Frozen Custard, Garbo's Maine Lobster, Boomerang's and more. Cocktails, beers and non-alcoholic beverages will be available for sale by the Long Center. The Long Center, Howdy Honda, Aquasana, El Jimador Tequila, New Belgium Brewing, Austin EastCiders, car2go, AT&T, Hanover South Lamar, BASSBOSS.